U.S. regulators have warned people not to use certain Claire's makeup products after samples tested positive for cancer-causing asbestos. The accessories retailer disputed the findings of the Food and Drug Administration and has refused regulators' request for a recall of the contaminated products. Those affected are Claire’s Eye Shadows, Batch/Lot No. : 08/17; Claire’s Compact Powder, Batch/Lot No. : 07/15; and Claire’s Contour Palette, Batch/Lot No: 04/17. 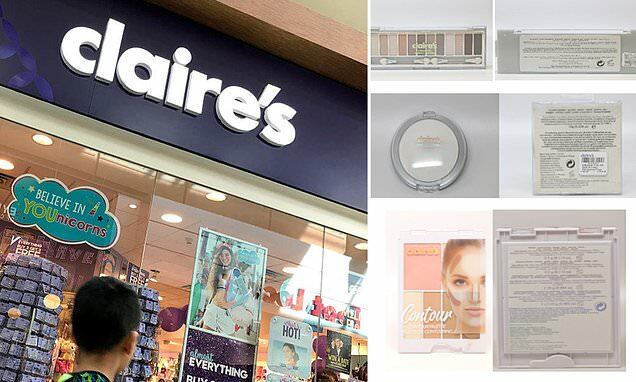 Claire’s noted in a statement that it removed the three products in question from its stores 'out of an abundance of caution,' and will also be removing any remaining talc-based cosmetics. But the jewelry and cosmetics maker claims the FDA’s test results have incorrectly identified fibers in its products as asbestos.